In fact, the coming of Live.Ly APK 4.1.4 has just got to another level. As we know, watching live streaming video has much more fun than a recorded streaming video. This new trend has been surfacing during the last few months. 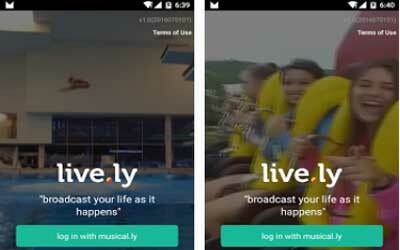 Well, Live.Ly connects the Musical.Ly creators and performs just like Facebook Live or Periscope. Shortly said, it is the app that allows you to see what others have to perform and to show yours. If you already have a fan base, this app will take you closer to fans and let them see what you’ve just got right away. There is no delay or recording. Everything is a live streaming. Now that the urgency to use Live.Ly has rushed you, begin to start having fun with this app and see how popular you can be. Since it is integrated with Musical.Ly, you can login to Live.Ly using Musical.Ly account. However, if you haven’t, simply login with Twitter or Facebook account. By logging in with Facebook account, all your information on Facebook will be accessed by Live.Ly. But, Live.Ly will not post anything to Facebook without your permission. For a secure login, you need to verify a phone number. Although this requirement has drawn anger, but you should not worry because any information of yours including phone number is protected. So, there’s no need to worry about somebody calling you. Once you have logged in and verified the account, start your first Live.Ly live streaming video. To do that, just tap on description bar in case you want to add some texts. Then, simply hit the big red bar saying “Go Live Now!”. Both rear-facing and front-facing camera can be used. Therefore, choose the most convenient one and make your sensation with Live.Ly for Android. It is a great app and helps Musical.ly musers get more fans. I love this app a lot and it works perfect! I have an Android tablet and I have been waiting for a long time for this version to come out. The app works smoothly and brings good quality.